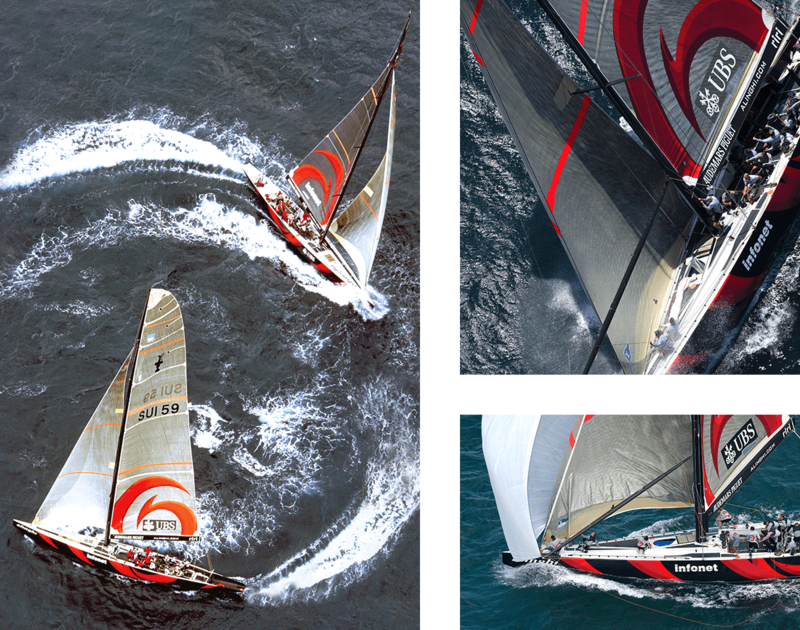 Alinghi was established as a professional team in 2000 with the intention of competing in the 2003 America’s Cup. Following success in a highly competitive Challenger series, the Alinghi team went on to make history in their quest for the world’s oldest international sporting trophy. Alinghi was, to be honest, a rank outsider for this, her first America’s Cup. No team had ever won the coveted trophy – the oldest in international sport – at the first attempt. It was soon clear however, that this time things would be different. Syndicate head Ernesto Bertartelli brought together a truly international group of sailors, including key players from the 2000 Cup-winning Team New Zealand. On the design and construction side, the experience also started to flood in. The team bought SUI59 from the previous Swiss challenge (the team ‘be happy’). They swiftly modified the cumbersome twin keels and set about designing two new 24m class yachts: SUI64 and SUI75. From the start the boats were revolutionary in their construction method; two longitudinal left and right sections glued together rather than the traditional method of joining the upper deck to the lower hull. This gave the boats unprecedented strength that was to prove vital for the coming races. With Swiss precision, a meticulous two-boat testing programme ensued, enabling the team to steadily fine-tune the hull, sail and appendages to gain vital seconds of boat speed that had escaped other teams. In the autumn of 2002, Alinghi lined up with eight other challengers for the start of the Louis Vuitton Cup, all vying for the chance to take on the Defender, Team New Zealand. By the end of the round robins, Alinghi held a narrow lead ahead of three other strong teams: Prada, One World and Oracle. However, the finals really saw the team hit their stride; easily seeing off Prada, and finally Oracle, to take the Louis Vuitton Trophy and become the official Challenger. The racing for the 31st America’s Cup was in reality far less closely fought than the Louis Vuitton series had been, but by no means less dramatic. As the Defender, Team New Zealand had missed the intensive training-ground that the Louis Vuitton Series had provided the Challenger with. Whilst Alinghi was gaining momentum, the Kiwis were battling with innovative but largely untested design features that proved to be their downfall. Alinghi finally took the series 5-0 to win the 31st America’s Cup on the 2nd of March 2003. In doing so, the syndicate became the first European team to ever win the Cup and the first to win at the first attempt.